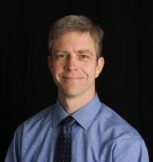 What are strategies for helping students be more physically active during the day, and how do we keep control of the group if they’re sitting less and moving more? Try having lessons take place in one area of the room, and student work take place somewhere else. Bringing students to the circle area for instruction and then sending them back to their seats to work adds a bit of natural movement to the lesson. 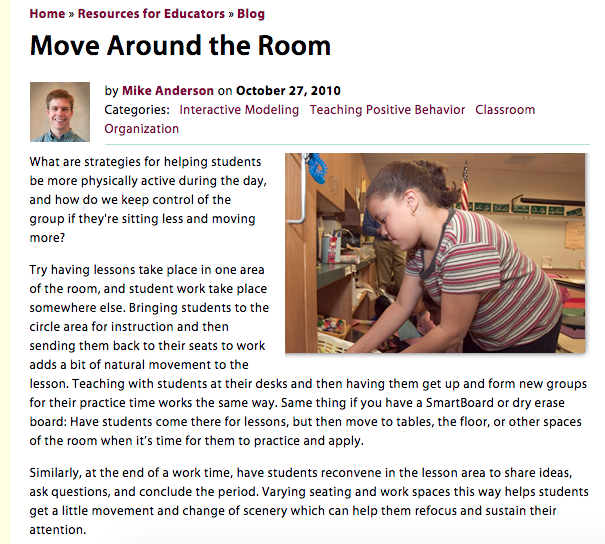 Teaching with students at their desks and then having them get up and form new groups for their practice time works the same way. Same thing if you have a SmartBoard or dry erase board: Have students come there for lessons, but then move to tables, the floor, or other spaces of the room when it’s time for them to practice and apply. Similarly, at the end of a work time, have students reconvene in the lesson area to share ideas, ask questions, and conclude the period. Varying seating and work spaces this way helps students get a little movement and change of scenery which can help them refocus and sustain their attention. 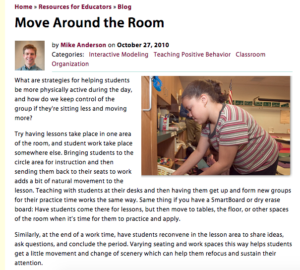 One thing to keep in mind, though—this strategy won’t work if your students don’t know how to move from one place to another quickly and safely. If you haven’t already, you’ll need to teach this skill—don’t assume it’s something your class just naturally knows how to do! If you’d like more guidance about how to teach this, have a look at the “Schedule and Routines” chapter from Margaret Wilson’s book, What Every 2nd Grade Teacher Needs to Know in the What Every Teacher Needs to Know series.